It's A Knockout This Week On The G Request Show! Boxing Champion Eric Donovan joins Chris in the studio, for chat, games and more, so tune! DUBLIN 1, Ireland - Sept. 29, 2017 - PRLog -- This week on the G Request Show, Chris welcomes, reigning Celtic Feather Weight Boxing Champion, AKA The 'Lilywhite Lightning', Eric Donovan. The Athy boxer first walked into a Boxing Club when he was seven-years-old. Four years later he won his first Irish title, aged 11. Eric was a five-time Irish champion, by the age of 15, a European medalist and had captained the Irish boxing team. That was when he left school to fulfil his ambition of becoming an Olympian. Eric spent a decade in the IABA's High-Performance Unit; trading punches with the household names like Katie Taylor, Michael Conlan, Kenneth Egan, Joe Ward and other Olympians. However, he narrowly missed out on competing at the 2008 Beijing Games. But like any real fighter, Eric did not let that keep him down. He Decided to get back in the ring, this time as a professional. Currently, the reigning Celtic Featherweight Champion, with five professional fight,s and five wins under his belt- three by Knock Out. Eric is here, in the studio to discuss his incredible career, so far and to say what is next for this talented Boxer. Chris will also try to challenge Eric to a little game, to determine who the real undisputed Champion is. You won't want to miss this one! 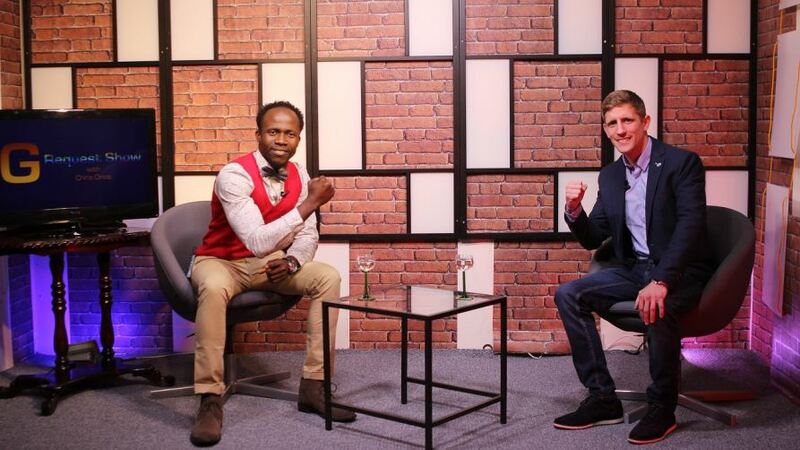 Tune into Ben Television Sky Channel 238 every Tuesday at 6.30 pm. Founded in 2005 when our Host, Chris Onos noticed the lack of social activities for the young people around his hometown of Tramore Co. Waterford and therefore set up the show as a music-based community programme. Since then, the show has grown from strength to strength, appearing in many different networks, including our current home on the Sky Platform, Channel 238. The show is now filmed in front of a live audience in Dublin city centre every week.